Well, I’ve been to a few of my early season walleye hot spots on Big Turtle Lake and Lake Bemidji, but I am sorry to report that those spots seem to be following the same theme of being late this season. 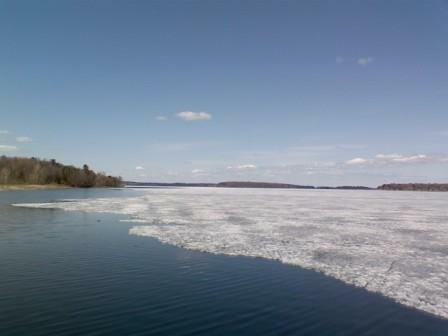 The late ice-out have left lake temperatures cooler than usual for this time of year, and, as can be expected in the lakes with deeper water, the eyes have yet to turn on. My fishing buddy, Zack, set the hook on the only cooperating walleye we found on Big Turtle, a nice 18 incher, using a jig and golden shiner. Zack was one of the many anglers who fished Upper Red Lake for opener, and he returned with stories of an excellent opening weekend on the big lake. On Big Turtle, we worked the honey hole, the sunken islands and the breaks around the peninsula and island, but it was an evening of fishing rather than catching. On Bemidji, Jake and I worked nearly the entire western shoreline. We also zig-zagged up and down the Diamond Bar and Flats and even made a shot in the dark at the Rock Pile. We found two eyes along the west shoreline in about eight feet of water, a 19 and a 16, and one fiesty perch on the Rock Pile, with a fireball jig and spottail shiner. We didn’t venture into Lake Irving which connects to Lake Bemidji via the Mississippi River, but early season reports from that smaller, shallower lake have been promising. 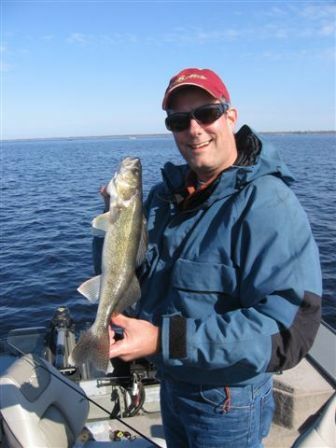 Lake Plantaganet just south of Bemidji has been producing some nice early season action. 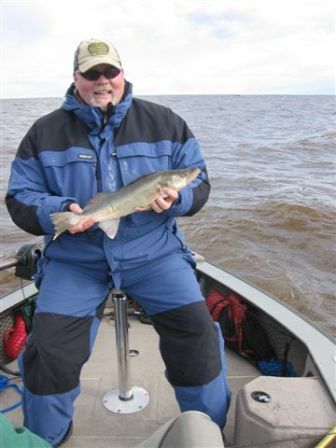 Trapper Marshall, a friend of mine who lives on the lake, reported he had set the hook on his 99th walleye of the season fishing exclusively on Plantaganet. The opening week of the Minnesota fishing season also happened to be finals week for me. 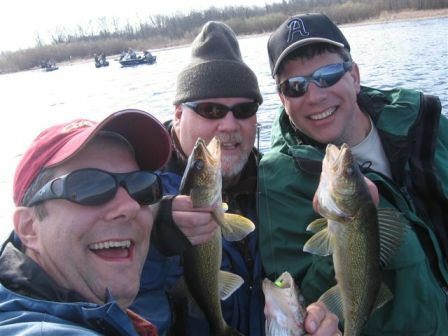 While I finished up cramming for final exams and polishing off term papers, my good friend Paul Nistler and friends Curt and Todd headed north for the warmer waters of Upper Red Lake and Lake of the Woods. That’s right, I said headed north for warmer water. Although some of the larger lakes in Northern and Central Minnesota were finally shedding this year’s ice pack, the shallow waters of Upper Red Lake had been ice-free and warming nicely and in fact the walleye bite had been on fire since opener. The guys stopped off at Red on Friday morning and anchored down near the mouth of the Tamarack River and soon found themselves in the midst of unbelieveable walleye fishing that included several triples. At Lake of the Woods, the boys found more of the same kind of action. By late Friday the winds had kicked up to gale force, but fishing Saturday in the shelter of Pine Island produced as well as anything to be expected at the walleye capital of the world.